Low prices. OrangeSmile.com offers car hire service in Guam on the lowest-rate-guarantee basis, since we work with car suppliers directly. For your search criteria in Guam, we always select and show the best rental offers. The car reservation process consists of 3 simple steps: (1) search for available cars for your dates in Guam; (2) select your car type; and (3) fill in the booking forms. Once the reservation is completed, you will receive a confirmation voucher to your email address. During the booking process, please check your rental conditions. To pick up your car at the rental point in Guam, you need to provide our confirmation voucher, your driving license and a valid credit card. The final payment is normally carried out at the pick-up point. Our car hire points in Guam accept VISA, MasterCard, etc - please check your rental conditions. At the pick-up point, please read the handling manual and check the car for present defects. OrangeSmile.com wishes you a pleasant journey to Guam! The car hire reservation system OrangeSmile.com allows renting a vehicle in Guam within 10 minutes. Our largest database of car suppliers enables us to provide you a rental car in Guam at the cheapest rate ever possible. At rental locations in Guam we offer the following car sizes: mini, compact, economy, standard, premium and luxury. The following car types are available in Guam: Sedan, Hatchback, Jeep, Cabriolet, Coupe, Minivan and Minibus. The discovery of this island is connected with an interesting legend. In the beginning of the 16th century, Ferdinand Magellan discovered the island, and cultural misunderstandings made him name it “the Island of Thieves”. Nowadays, we know the island under the name Guam. The island belongs to the territory of the United States, and it has become a popular destination for beach rest and water sports. The island is conventionally divided into three regions. 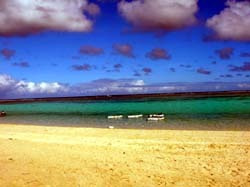 The Northern part of the island is the location of US military bases, several villages and Ritidian Beach – one of the most beautiful beaches in whole Guam. The Central Region is the most populated. The majority of restaurants, hotels, tourist villages and shops are located there. The Southern Region is the best choice for fans of nature landmarks. This part of the island is the most untouched one and is famous for the Chamorro culture spots, Cocos Island and black sand beaches of Talofofo. Most pristine white-sanded beaches can be found at Ritidan Point National Wildlife Reserve. The place is very popular and can be crowded on weekends, so travelers are recommended to visit it on weekdays to enjoy calm atmosphere of this place. Continue your travel with a visit to Mount Lamlam, the highest point of Guam. Even though it’s called a mountain, Lamlam is more like a hill because its height is only 400m. However, it’s not easy to climb it, but when you do, breath-taking views of the island and the ocean will be your reward. Umatac is a historic village, a visit to which will help you learn about the history and culture of the island. Indigenous people considered this place sacred as according to their beliefs first people were created near it. Later, in 1521, Magellan landed at the Umatac Bay. There is a monument dedicated to this discovery in Umatac. Ruins of ancient Saint Dionicio Church are located nearby. Every March, a special ceremony is held in Umatac to celebrate the Magellan’s landing. Don’t forget to visit Fort Nuestra Senora de la Soledad to enjoy panoramic views of the area. The most famous attractions of the capital city, Hagatna, are the statue of Pope John Paul II and a miniature copy of the Statue of Liberty. Other popular attractions include Cocos Island perfect for water sports, Two Lovers Point cliff, War In The Pacific National Historical Park dedicated to WWII, and jungle villages of Talofofo. If, according to the voucher, you should be met at the airport in Guam (Meet and Greet) - please leave the baggage hall and look for an employee with a sign indicating your name or the name of the rental company. Rental offices in Guam are often picky to delays in returning the rented cars, so it is better to arrive at the office on the specified time.